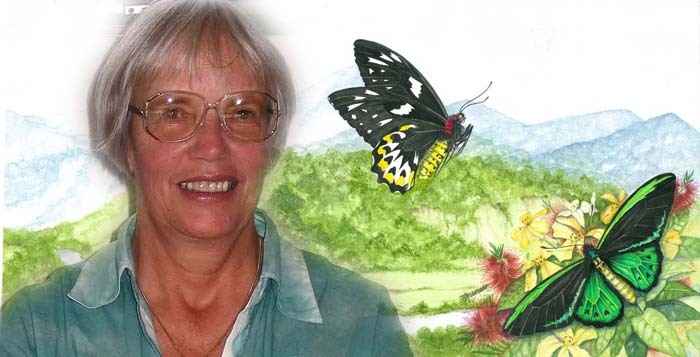 Greater Glider published her first book Micky’s Music, a story about a soldier crab, in 1998. Her many articles published in camping magazines also highlight her love of the natural world. Lynette and her husband Peter are foundation members of the Friends of the Gold Coast Regional Botanic Garden (www.friendsgcrbg.org.au). Lynette is currently vice-president and Peter membership officer. He is also the leader of the Friends’ Special Interest Group Australian Plants Gold Coast and its representative on their management committee. They are two of the directors of Myall Park Botanic Garden and she edits their newsletter (www.myallparkbotanicgarden.org.au). When not involved in voluntary activities, they are addicted to bird watching and to photographing native flowering plants – especially while camping. The following is a bit of my background and thinking about the book. For some years now I have been fascinated by the plight of the beautiful Richmond Birdwing Butterfly – how in the 1800s it was common in the streets of Brisbane and now is classified as ‘vulnerable’ due to clearing of its habitat. CSIRO entomologist Don Sands has done lots over the years to encourage the growth of its larval food plant – the Birdwing vine Pararistolochia praevenosa – into private and public areas. Slowly they and the butterflies are growing in numbers as vegetated corridors with feeding stations are developed. Here on the Gold Coast, Graham McDonald has succeeded in not only growing the vines in Hinterland Regional Park but has recorded the butterflies laying and hatching there. In Elanora Helena Kelso has had success also. The Friends of the Gold Coast Regional Botanic Gardens (to which we three belong) seek to be part of a butterfly corridor along the Nerang River by planting sufficient numbers of Richmond Birdwing vines in suitable sites in the Gardens. Appropriate educational signs at the proposed plantings near the existing butterfly garden will alert and draw visitors. I thought it was time a new generation of children was introduced to this beautiful ‘fairy of the forest’ – hence ‘Birdwings’ New Home’. I decided to be proactive in helping the Friends publish it. Our Australian Plants group within the Friends of the Gold Coast Regional Botanic Gardens self-published ‘Grow Natives on the Gold Coast’ some years ago. Having taken the colour pics, edited and indexed the text for that book, and done most of its marketing and selling, I felt I knew a bit of what I was letting myself in for. 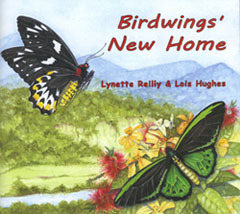 A year later our dream has arrived in the form of this beautiful book, with brilliant illustrations by butterfly and botanical artist Lois Hughes. More background: This beautiful butterfly has a ‘vulnerable’ conservation status. Although it was once found from Maryborough south to Grafton, two-thirds of this original range has been lost due to land clearing. The Richmond Birdwing Conservation Network (a subgroup of the Wildlife Preservation Society Q) aims to re-establish contiguous habitat corridors joining remnant patches; provide food resources for butterflies at links and stations and continue the outbreeding program (locally carried out at Fleays) to release progeny back into the wild. Much successful breeding of butterflies in corridors has been reported this summer. I am enchanted by both the book and its history – including details of successful responses to planting the Birdwing Vine in contiguous corridors. These stories of ‘the power of one’ should be spread through our communities to encourage many more to try. The results would be dynamic! Thank you Lyn.